1. Insurance companies are unlikely to inform you of other sources of recovery. Their interest is in minimizing their liability and getting you to sign a waiver releasing them from further liability. Speak with someone at Bradley D. Souders, P.A. a Tampa motorcycle accident attorney with a solid reputation for helping injured bikers in the state of Florida. He can help you find out your options for recovering damages. 2. The Importance of Uninsured Motorist Coverage! The perception is that bikers speed and weave in and out of traffic. And when it comes to suffering motorcycle accidents, many insurance companies believe injured bikers are getting what they deserve. It is difficult to get a fair settlement without preparing a case for trial. Attorney Bradley D. Souders, of Tampa is prepared to fight these unfair stereotypes and position you and your case for a maximum recovery. 3. Purchasing Underinsured Motorist Coverage and Uninsured Motorist Coverage is essential for you to protect yourself properly. 4. The additional coverage will not cost an arm and a leg, and some day might save you both. 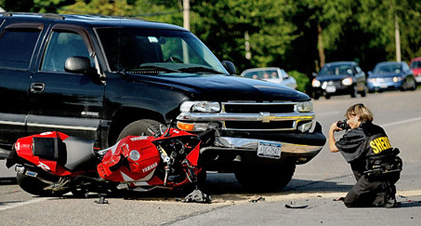 Recommended coverage for riders is to insure for $100,000 per person, $300,000 per accident. The insurance carriers require you purchase liability insurance at the same level. 5. Some states, such as Florida, do not require Medical Expense Coverage, also known as First-Party Coverage. This coverage pays medical expenses on behalf of the policyholder. Carry this protection so your medical bills will be covered if you have a motorcycle accident. Whether you were involved in a motorcycle accident or simply have questions about motorcycle insurance coverage, Attorney Brad Souders of Hog Law can help answer your questions. Call him today at 1-866-HOGLAW1 (1-866-464-5291). You can also email him directly at brad@hoglaw.com or call (813) 220-7767 for immediate assistance. As a motorcycle rider in the state of Florida, it is your responsibility to familiarize yourself with Florida laws. An accident can happen in the blink of an eye. Be prepared! Complete our free online case evaluation form & we'll contact you.